Since I last sat down to write, we left Germany and spent 8 nights in Sofia, Bulgaria. We had maxed out our time within the Schengen zone in Europe and had to spend a few days outside of that zone. Since we had already visited Ireland and the UK, we opted to visit Bulgaria. I’m not sure that we could have had a better location in Sofia. We were a block away from a gorgeous pedestrian boulevard (Vitosha Street) which was lined with beautiful shops and lovely places to sit and have a coffee. Unfortunately, I hurt my knee a day or so into our visit… and my knee didn’t like the 64 steps up (or down) from our apartment. So, our excursions out were limited (as are my photos). We did have a beautiful view from our apartment window though… AND on our last day there, Marcus and I snuck over to the #1 Desert Place in Sofia for a coffee and cake. That place deserves the reputation that it has. Our desert (which apparently translates into “Chocolate Kiss”) is in the running for the best thing I have ever tasted. Yesterday, we could enter the Schengen zone again and we took a (super early) flight into Rome. Yesterday was arguably one of the roughest travel days that we have experienced. We had to take a bus from the airport into Rome Termini station, and Marcus forgot his C-Pap machine on the bus. Everything worked out well (we waited for the bus – and Marcus got it back). But, we had to wait a bit barely sheltered from a torrential downpour. Poor Artie curled up into a little ball beside our luggage while we were waiting… I felt so bad for the tired little guy. We had a few hours to kill before we could go to our apartment, so we did a round on the tour bus. We were all wet by that point from the rain, and most of our crew slept through a fair amount of the tour. But, because the top floor of the bus was filled with rain, every time that it stopped and started, a river of rainwater moved from the back to the front of the bus, drenching people’s feet and waking them up. 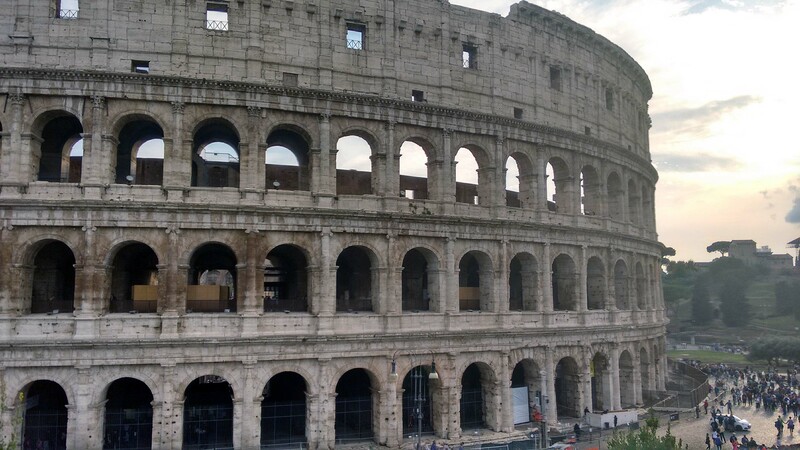 Those of us who were awake though, got to view some pretty amazing sights like the Coliseum. After a good sleep in our lovely apartment here in Rome, we headed out today for more touring. Rome is a beautiful city, filled with a tremendous amount of history. This is a photo of the Circus Maximus, which was a chariot racing site. In the distance, you can see the ruins in the Palatine hill. It was interesting to learn that the Arch of Constantine served as the inspiration for many other arches that we have seen in our travels, such as the Arc de Triomphe in Paris, Marble Arch in London, and the Brandenburg Gate which we just visited in Germany a couple of weeks ago. I wish that I had gotten a better photo of is (and perhaps one without lovers in the foreground…). The river that runs through Rome is the Tiber. While we didn’t get a chance to tour the city by boat, I have no doubt that the bridges here are just as spectacular as they are in so many other European cities. The highlight of our day today for me was the Trevi Fountain. It was spectacular. The area around the fountain was crazy, crazy busy with tourists. Morgan and Artie managed to throw coins into the fountain (and actually got them into the fountain – and not onto the heads of the people down closer to it). Apparently 3000+ Euros are tossed into the fountain each day. The money thrown into the fountain serves to support charities within the city. And of course, we ate while we were in Rome. Artie wanted me to share with you the chocolates that he picked out (and consumed with delight). I’ve eaten a few rice balls (Arancini) over the past two days. What a delightful taste experience! I wish I had known sooner how wonderful they are. And, I can’t remember what this cake was called, but it was wonderful too. We leave Rome tomorrow and head to the port town of Civitavecchia to start our journey home. We will be taking a re-positioning cruise across the Atlantic to Miami. Crossing the Atlantic by boat is something that was on my own “bucket list”, so I’m thrilled that we could make it work to do this. We’re all looking forward to the pampering and adventure that goes along with a cruise. We’ll have very limited (if any) internet connection over the next couple of weeks, so we’ll have to do some “catch up” on the blog when we get back to North America.